Today all the cycling websites on the SRAM media mailing list have announced the debut of Apex1, SRAM’s new entry-level 1x drivetrain for dropbar and flatbar road/gravel bikes. But Bike Hugger is a way ahead of them because I…..Mark V, humble priest of Her Church of Immaculate Wrenches….have already installed an Apex1 group on a 333fab titanium gravel bike, which is currently in a van on the road to NAHBS. Of course, I’m sure all the product managers for the big bike companies have known about Apex1 since late 2014, because that’s how this industry works. But that’s a story for another day. For now, let me tell you about putting Apex1 onto a bike for NAHBS. So Max Kullaway of 333fab Bicycles registered for NAHBS months ago, and somehow or another SRAM agreed to supply an Apex1 group for a 333fab to go into the SRAM display booth at NAHBS. As the buyer/assembler at the Davidson & Kullaway Custom Bicycles studio (the frameshop for 333fab and Davidson Bicycles), I usually handle all the bike kit ordering through various vendors, but this deal was brokered entirely without my knowledge. That is until I was told to send SRAM a list of individual parts for the Apex1 group. Perhaps the layperson doesn’t realize that all these big time venders work off their own in-house SKU# (typically 7 to 10 digits) on everything they sell, and I had to order a collection of items for which no one, including apparently our contacts at SRAM, had SKU numbers. But SRAM couldn’t process our order without the correct SKU#……hmmmm. I don’t know how all that played out, but Max eventually appealed to someone at SRAM who could shove that order out the door. So with two weeks before NAHBS, UPS drops off a box with red & white SRAM logos at Davidson & Kullaway. SRAM’s Apex1 will bring the simplicity/performance of 1×11 drivetrains and the power of hydraulic disc brakes to a very attractive price point. 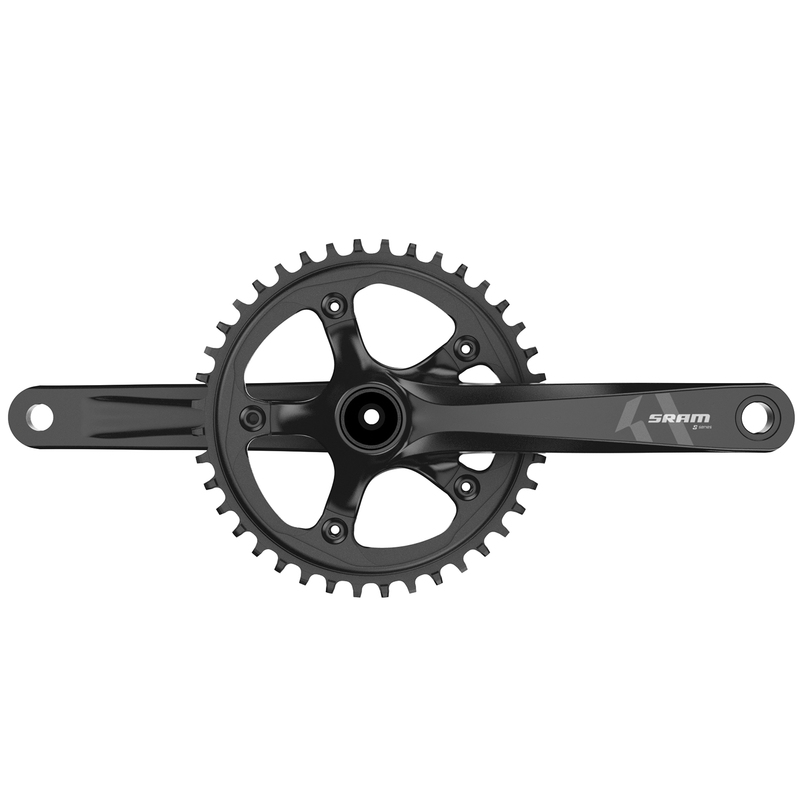 The 11speed drivetrain incorporates the same X-Sync chainring technology as was first developed for the pioneering XX1 mountainbike drivetrain and later used in the Force1 and Rival1 road groups. Apex1 has its own crankset design with an integrated spider, differing from the modular spider designs of the more expensive groups. The 333fab bike I built for the show used a GXP-style crank, but Apex1 is also available in a BB30/PF30 design. Rather than irksome hidden fifth-bolt pattern of the higher models, Apex1 has a conventional 110mm bcd five-arm pattern. Chainrings are available in 38, 40, 42, and 44tooth sizes. Like all SRAM X-Horizon (1x specific) rear derailleurs, Apex1’s has a non-slanting parallelogram and a top pulley widely spaced from the cage pivot. Looking at the Apex1, I could see how costs were saved with less expensive details like stamped steel rather than forged aluminium, but the overall finish and construction was rather nice. The weight is reasonable compared to more expensive X-Horizon derailleurs, but frankly all of them are kinda chunky no matter how expensive. Unlike the other road X-Horizon models, Apex1 seems to be available only as a long cage, with no mention of medium cage in the press release. 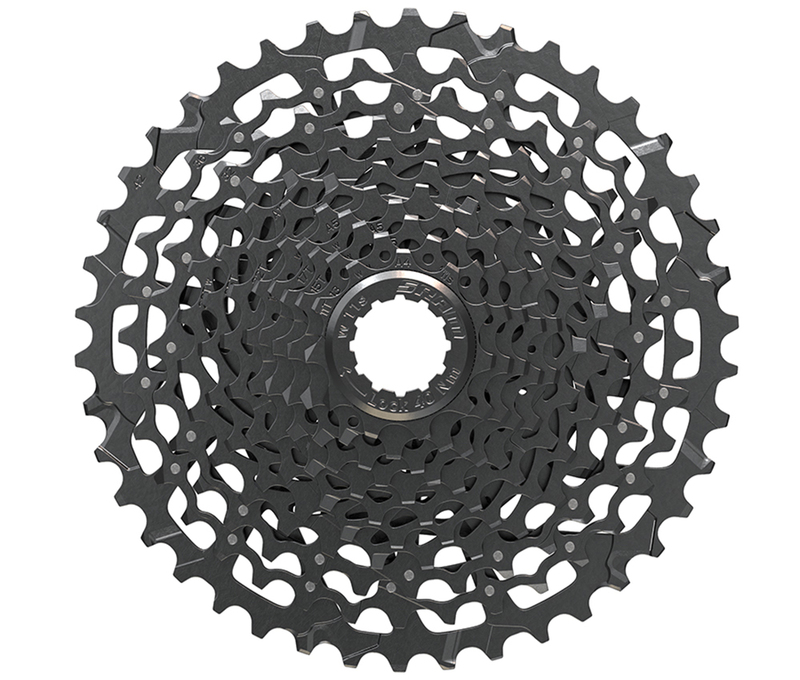 The other big departure from Rival1 and Force1 is the wide-range 11speed cassette. Apex1’s PG-1130 cassette is 11-42, not 10-42. This means that the Apex1 cassette does not require a hub with an XD-style cassette body. Instead, the 11-42 cassette can fit on 10sp or 11sp (with a spacer) HG-style cassette bodies, which will make it easier to fit wide-range 1×11 on bikes for both OEM product managers and aftermarket consumers. But if you really want to use a 10-42 XD cassette, don’t worry; the Apex1 can handle it. I know because I spec’ed a 10-42 XG-1150 on the 333fab bike. The Apex1 hydro levers look identical to Rival1, and if anything I like the Apex1 graphics better. 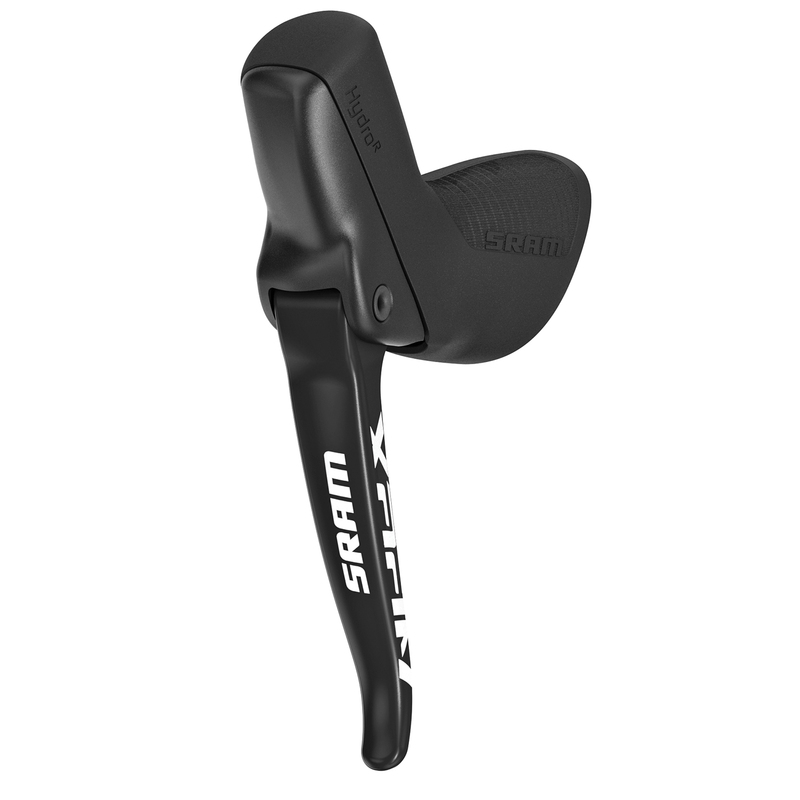 Like all of the SRAM hydraulic dropbar levers, the Apex1 has a nice lever feel. Unlike Shimano, the pads make contact with the rotor well before you exhaust all the lever throw. Shift action feels good, though all the X-Horizon rear derailleurs feel a skosh heavy due to the roller clutch. 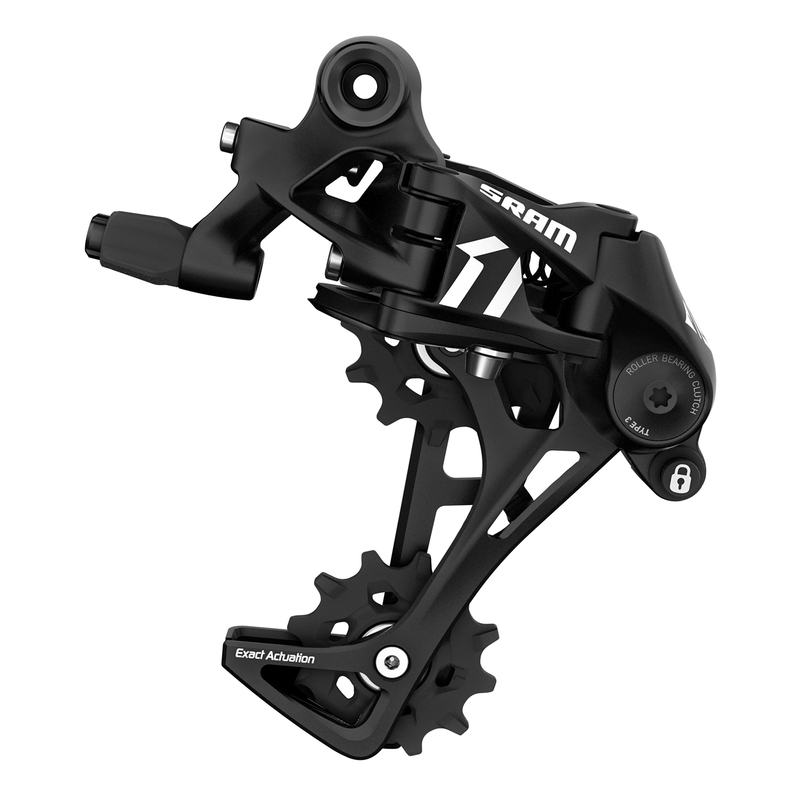 There’s also a 11sp shifter pod for flatbar bikes; in that case I guess you’d just borrow a brakeset from SRAM’s mtb line, since there are no Apex1 flatbar brake levers. Honestly I blindly ordered the Apex1, knowing but a few vague specs and nothing about pricing until this morning. But the pricing is really good, no joke.